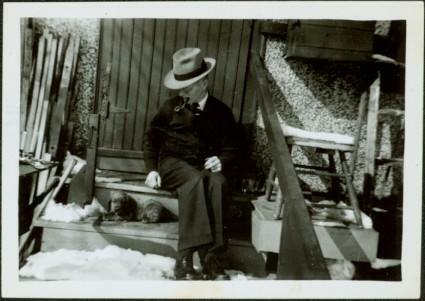 A man named Mr. Blamey sits beside dog while smoking a pipe. Unknown building in background. Ladder and stool on right, building material on left. Handwritten annotation on recto of photograph: "Mr. Blamey on Buddy when he was tiny" (see also item 2009.5.2.262 for reference to Blamey family). Stamped annotation on recto of photograph: "1145".